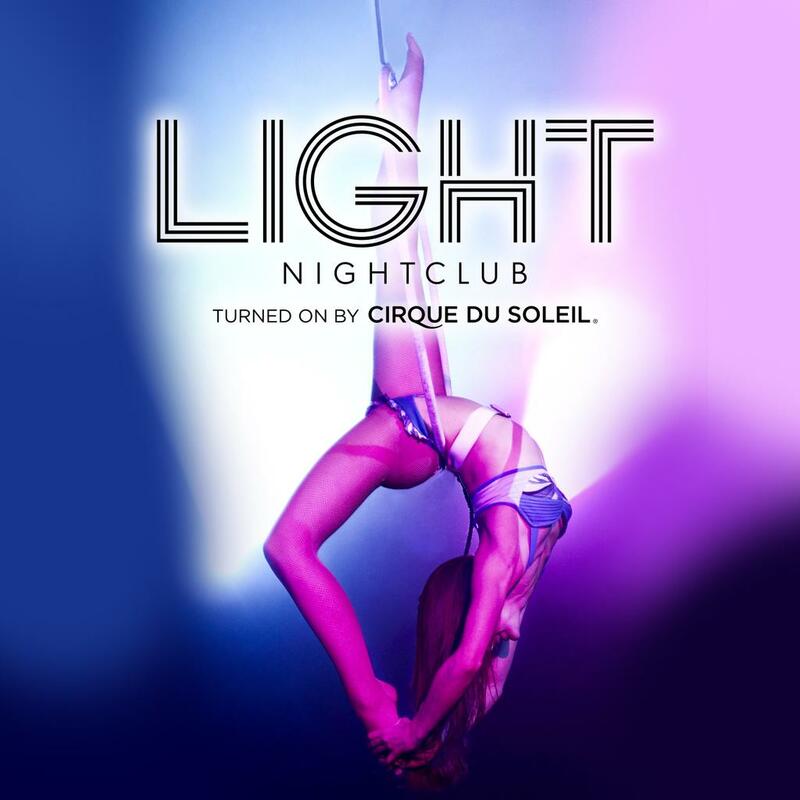 LIGHT, the first-ever nightclub turned on by Cirque du Soleil, merges cutting edge creativity with incredible music to produce the a new kind of nightlife experience. The chic, fashion-forward. TK-square foot venue featuring state-of-the-art production, theatricals and of course world-renowned DJs, will power up a new kind of passion and creativity, twisting the experience of a “night out” and to create a unique, memorable event each night. Designed as an experience that plays with your senses, LIGHT — put on by Cirque du Soleil — offers far more than the traditional nightclub. 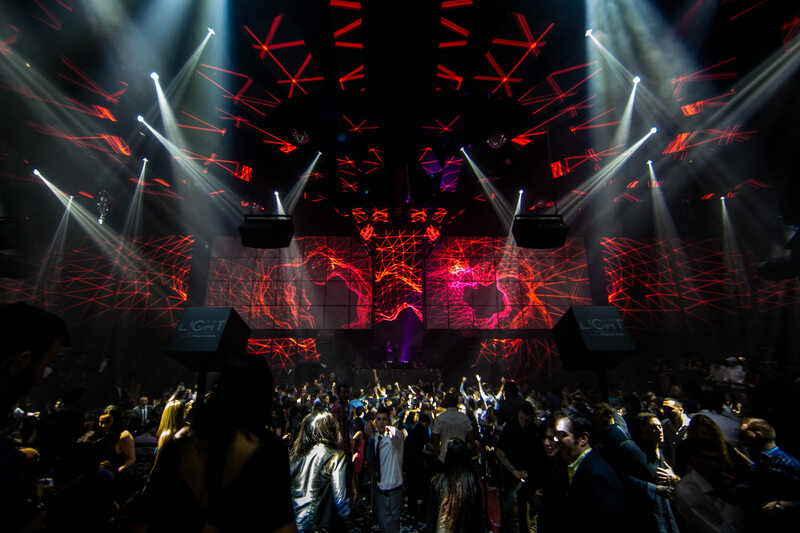 Upon arriving at LIGHT, guests enter the realm of the unknown, as everyone in the club is part of the show and this is the very essence of how light will shine. 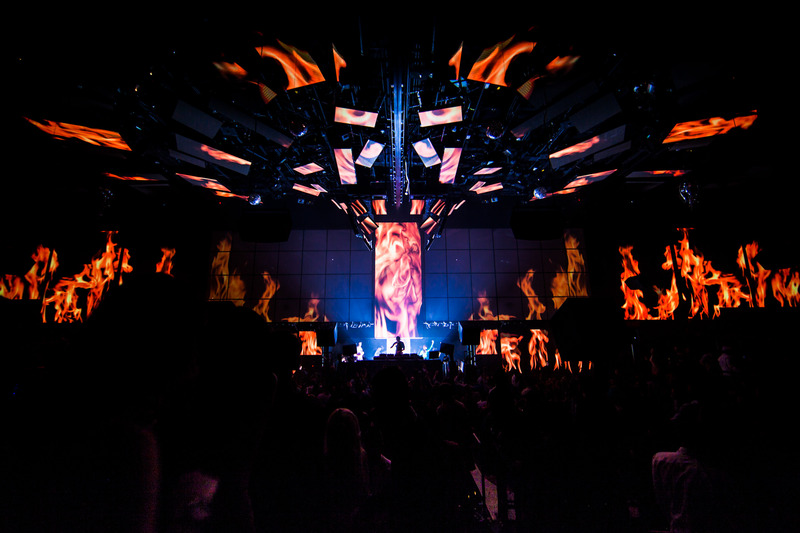 Headlining DJs lead the charge, coupled with exclusively built performance elements and visuals provided by video mapping, lighting, sound and special effects experts Moment Factory, as well as avant-garde costumes and unique choreography. At LIGHT no two nights out will be the same. 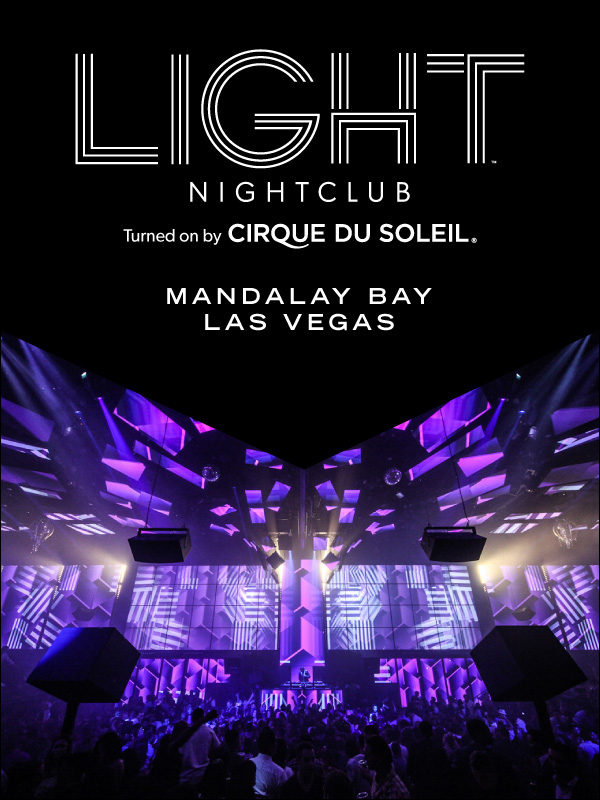 The presence of Light at Mandalay Bay [on the south end of The Strip, the same casino/resort that houses Cirque’s latest resident show, Michael Jackson ONE] is the convergence of several premier entertainment organizations, including the Light Group, a leading hospitality, development, and management company; Moment Factory, of Montréal, Canada, which provides the extravagant background visual effects throughout the club; Cirque du Soleil, also of Montréal, which presents the nightly aerial acrobatics over the dance floor; and John Lyons Systems, of Hollywood, California, which provides the audio-visual entertainment that beams out every night during showtime. While all of the entertainment aspects of Light are important, its audio-visual infrastructure is the spine on which everything else hangs. John Lyons Systems installed the infrastructure. 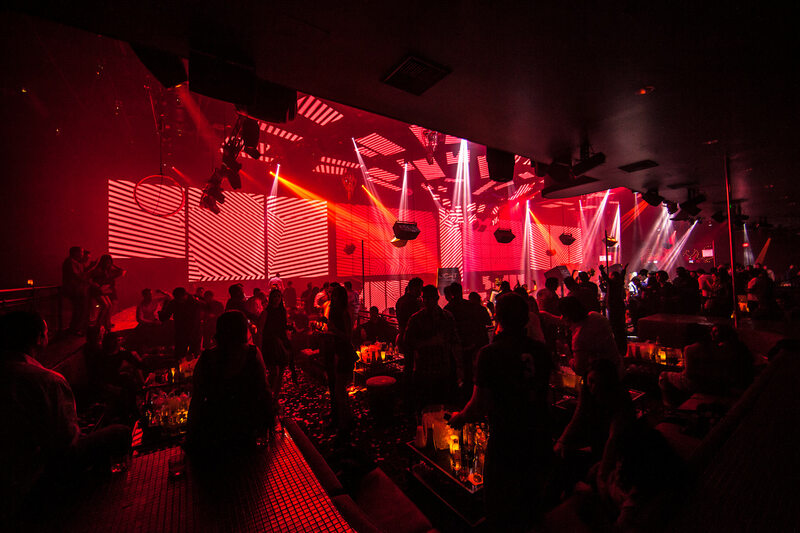 Its founder, John Lyons, currently owns and operates five nightclubs around the US including the renowned Avalon Hollywood. 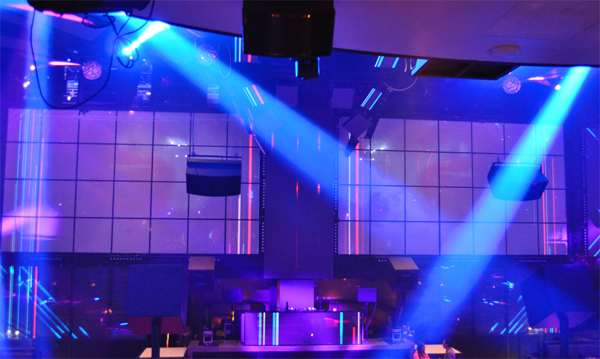 John Lyons Systems designs and installs audio-visual entertainment systems for all his nightclubs and other nightclubs. 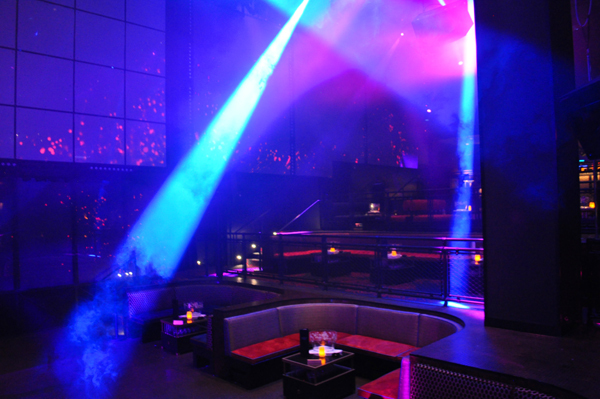 Light is 38,000 square feet of drinking, dance, and DJ entertainment. 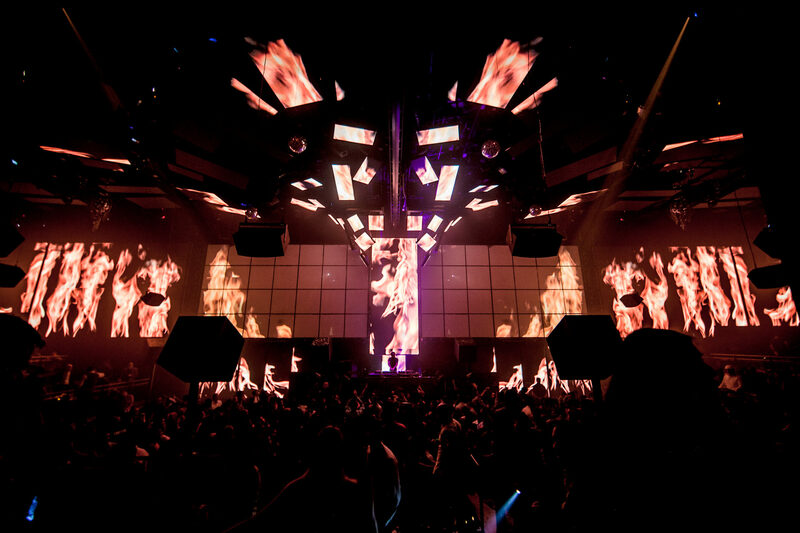 Its front-of-house space is composed of huge (almost floor-to-ceiling) LED screens located left and right of the DJ booth. 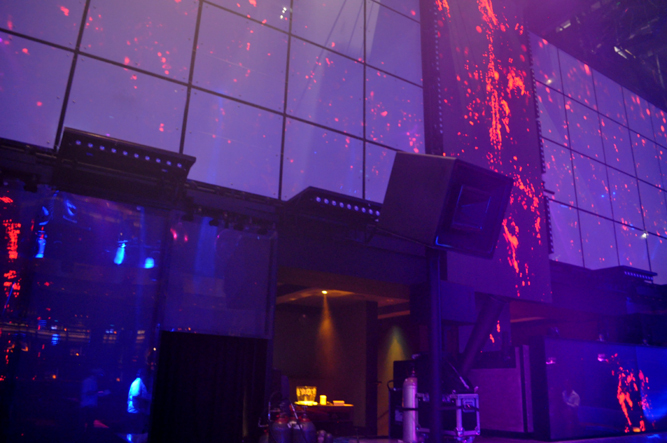 A smaller LED screen is found in front of the DJ booth. Below the latter, a speaker chamber is filled with compact front-of-house speakers. 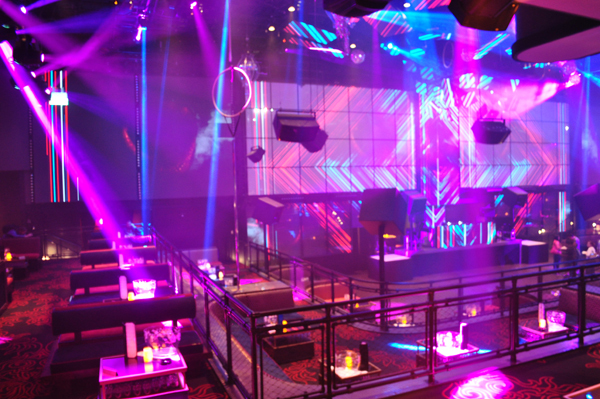 Facing the speakers is a large dance floor surrounded by table booths; overhead is a mezzanine with more table booths. Effects gear includes two Artistry In Motion Mini Blaster confetti cannons, eight Antari SD200 snow machines, six Antari Z1000iii and four Z-1020 fog machines, 18 Martin Professional Jem Hydra fog systems, two Look Solutions Unique2 hazers, and 24 Elation AF-5 fans. 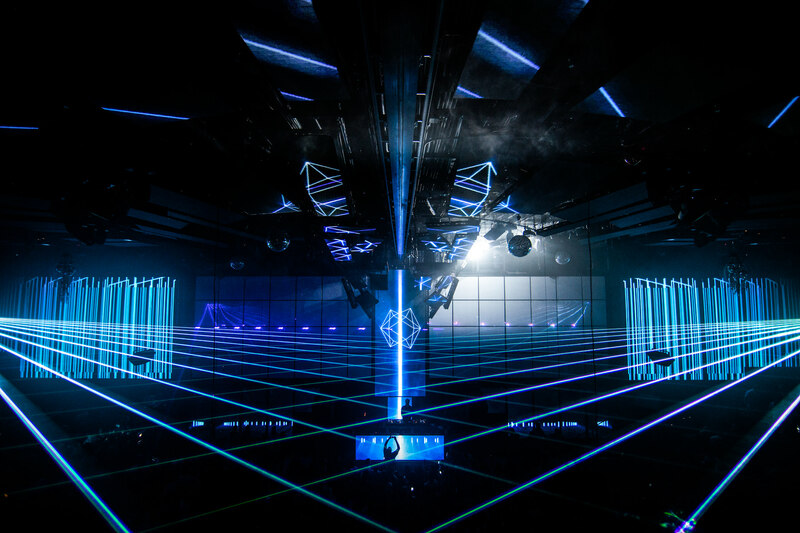 “The challenge with Light was to not only to create a perfect audio space on the dance floor,” Lyons says, “but also to have the same experience move from the dance floor to the surrounding table booth spaces." 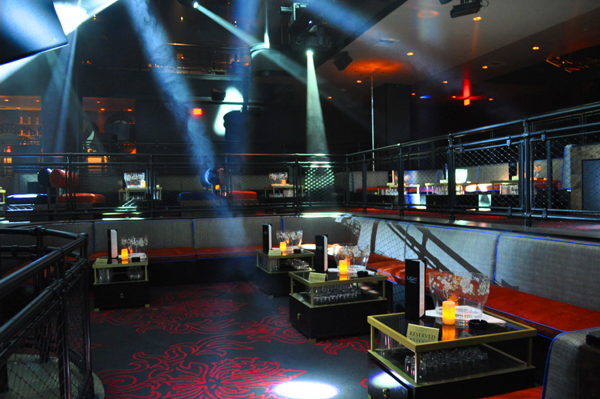 To implement the audio environment at Light, "I installed five separate, but connected, audio systems, one for the dance floor and one for each of the table booth zones in the lower and mezzanine levels of the space—a total of more than 176 various speakers that completely envelop the club and present a perfect music experience regardless of where you are positioned in the room." Lyons describes the DJ station as the usual configuration of an audio mixer and playback setup, including a Rane SL4 USB interface that connects up to four vinyl or CD turntables, a Pioneer DJ mixer (DJM-900), and a Pioneer digital playback unit (CDJ-2000) for CD and USB memory sticks. “It was meant to be a good home hi-fi system in a night club, which was achieved with the best audio equipment available for the most perfect audience listening experience we could get,” he says. Also featured in the sound system are QSC AD-S82H and ADC152ST units; Crown MA 5000i, MA 9000i, CDI 4002, and XTi 4002 amplifiers, and BSS BLU-160 8 x 8 network processors. 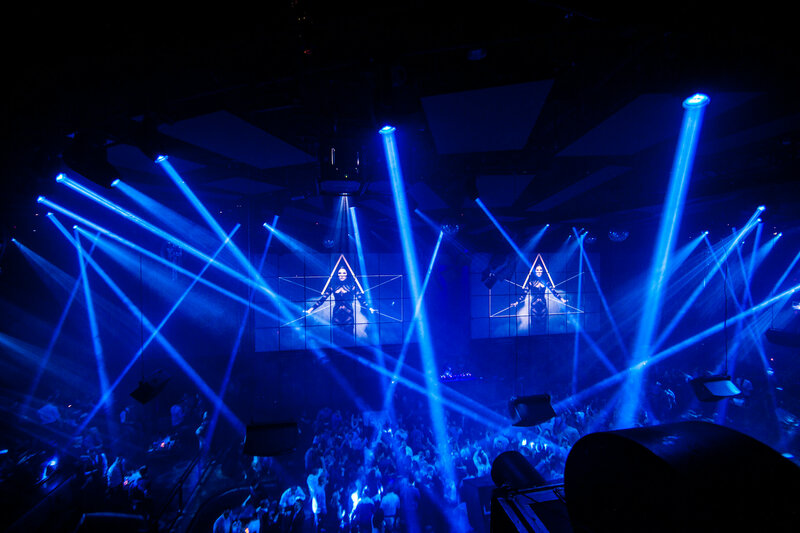 With the audio set in place, Lyons turned his attention to Light’s visual environment, which includes theatrical lighting, video projection, laser, and a series of LED displays deployed through the club space, which is distinguished by visual effects in the front of house, ceiling displays, and separate club lighting to light up the dance floor and acro performers. 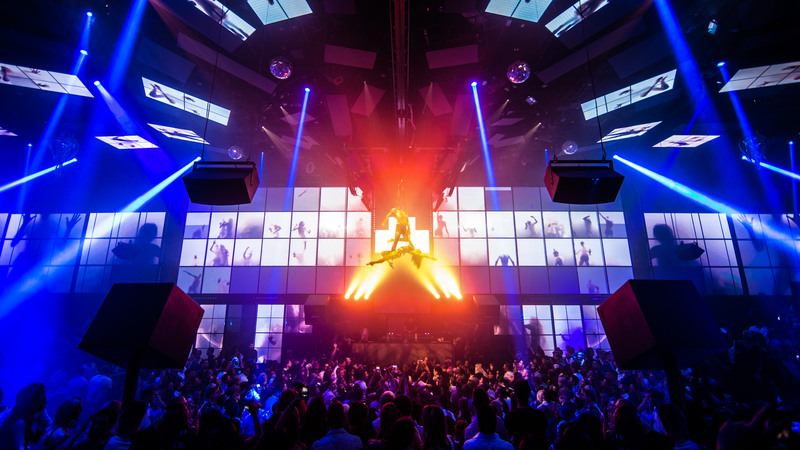 Lighting for the dance floor and surrounding club space comes from a collection of ceiling-hung lighting trusses, each with a series of lighting fixtures and fog and haze machines. 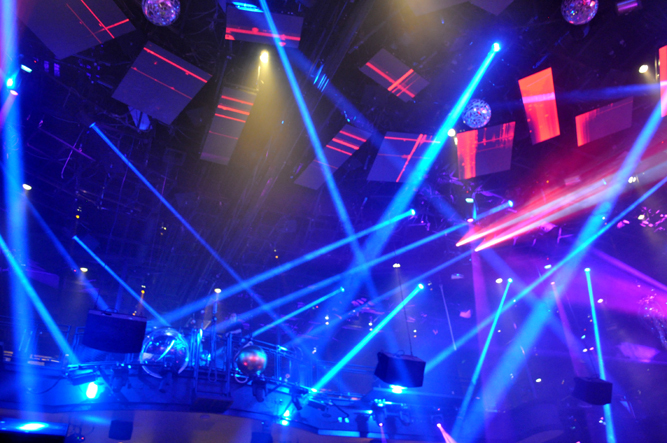 On the lighting trusses is an illuminated syncopation of lighting instruments, including Elation Platinum Series units, Martin Professional Atomic strobes, UV PAR lights, mirror balls, and fogging and haze mists, all going off simultaneously throughout the night. The lighting trusses are also formed into semi-circular arcs and are alternately placed between the ceiling LED displays. The full lineup of lighting gear includes 28 Elation Professional Platinum Spot 35Rs, 44 Elation Platinum Spot 5R Pros, 12 Elation Platinum Spot 15R Pros, 12 Elation Platinum Beam 15Rs, 48 Elation Platinum 5Rs, eight Elation Rayzor Q7s, 16 Martin Professional Atomic strobes, 12 Diversitronics 16DMX 16-channel DMX controllers, 192 Diversitronics strobe fingers, 26 Elation Event Bars, 28 Chauvet Professional COLORado Batten 72s, 18 ETC Source Four LEDs, 60 OXO Funstrip warm white LED strips, and 12 Elation Opti 12 UV PARs. 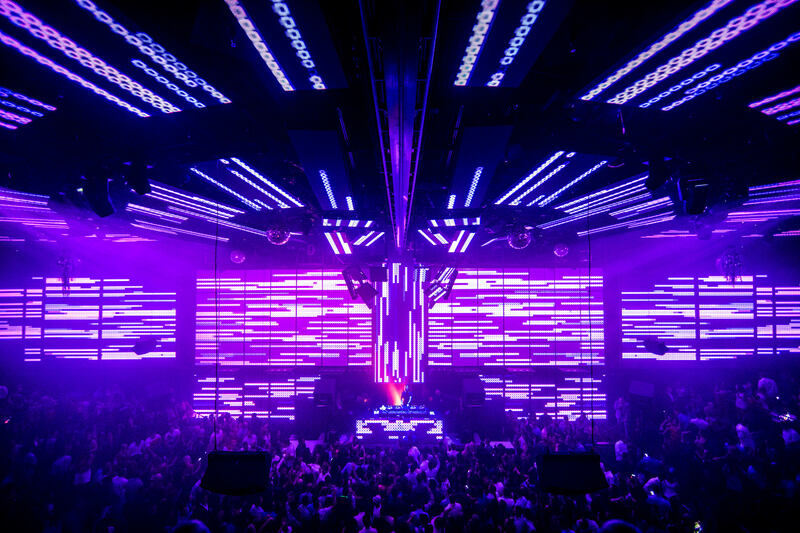 Elation also provided 84 custom in-ground RGB LED units and 18 custom warm white LED units. 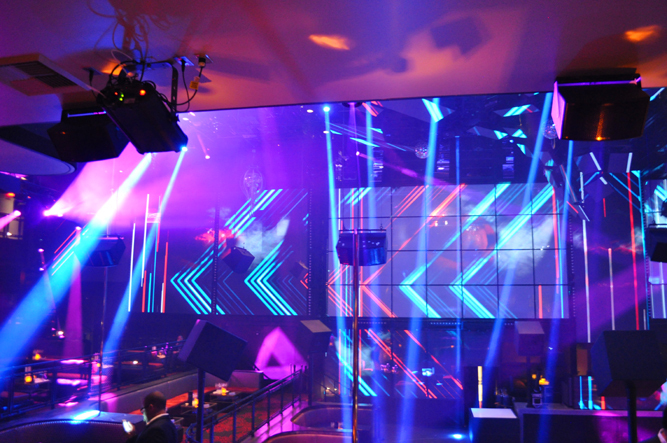 Lighting is controlled by a ShowCad PC-based system, with the network including 50 Pathport nodes distributed around the room. As for visual effects, the most predominant feature is the front of house with its projection display consisting of a 120' x 30' hybrid screen, partly made up of LED panels and partly of a translucent polycarbonate material. 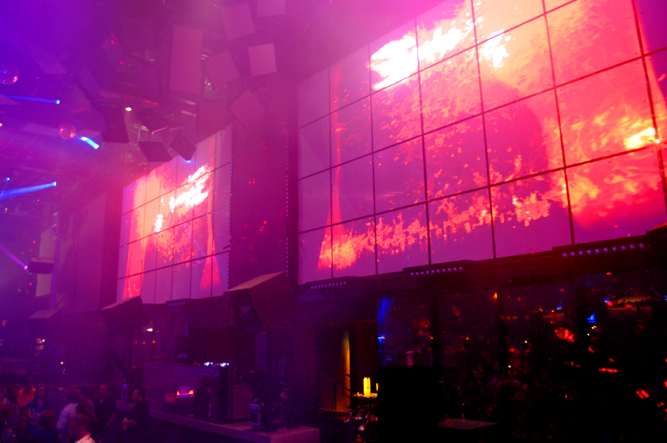 There is a judicious use of LED video displays throughout the front and ceiling of the night club. All the LED modules are custom manufactured with a 6mm pitch. 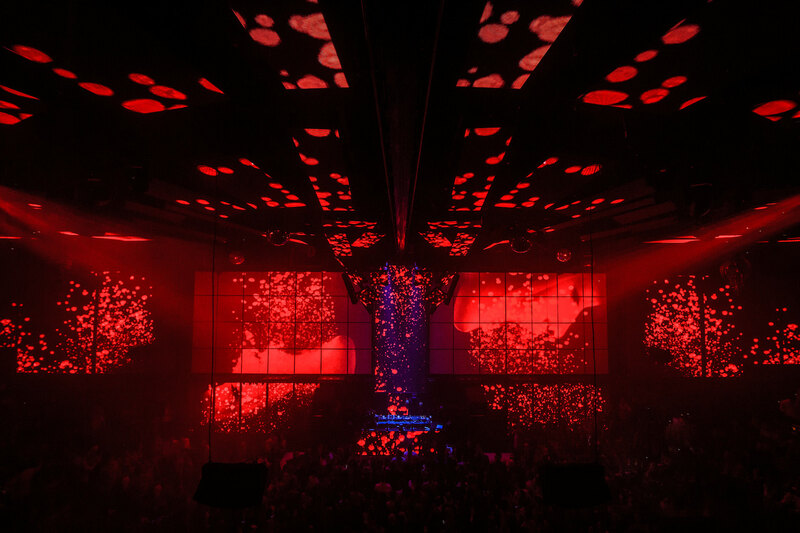 In an interesting extension, the central DJ screen continues upward, breaking up and cascading into multiple LED fragment displays embedded within the ceiling. 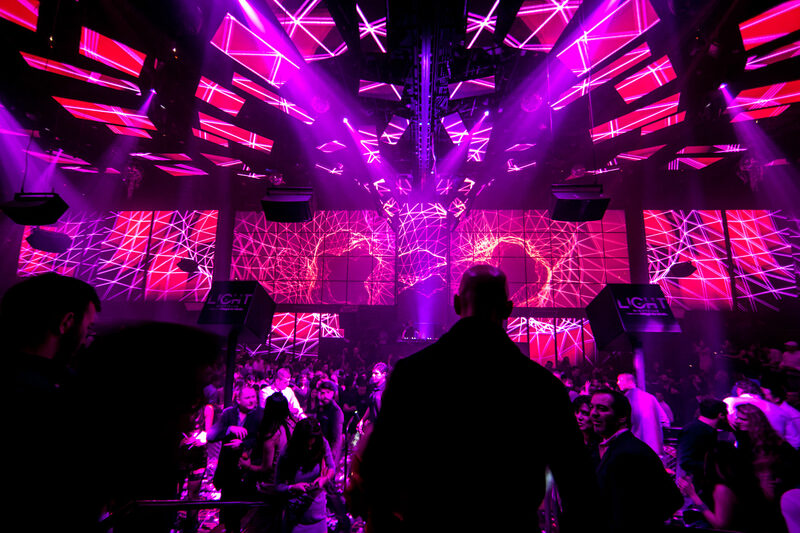 This becomes three semi-circular displays that curve around the ceiling facing toward the DJ space. The visual imagery was conceived by Moment Factory. 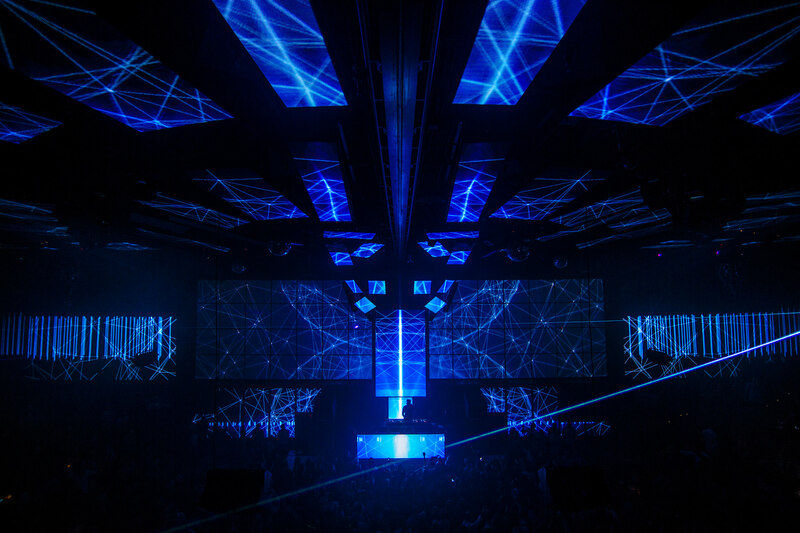 The final content was synchronized between the main screen and ceiling screens, creating a unified effect. 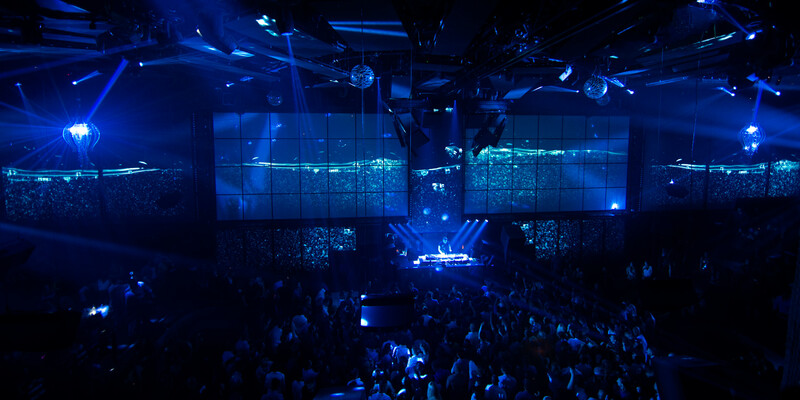 One especially unique visual/theatrical effect is the front-of-house LED/rear projection screen, which hides a small stage behind the rear projection screen. 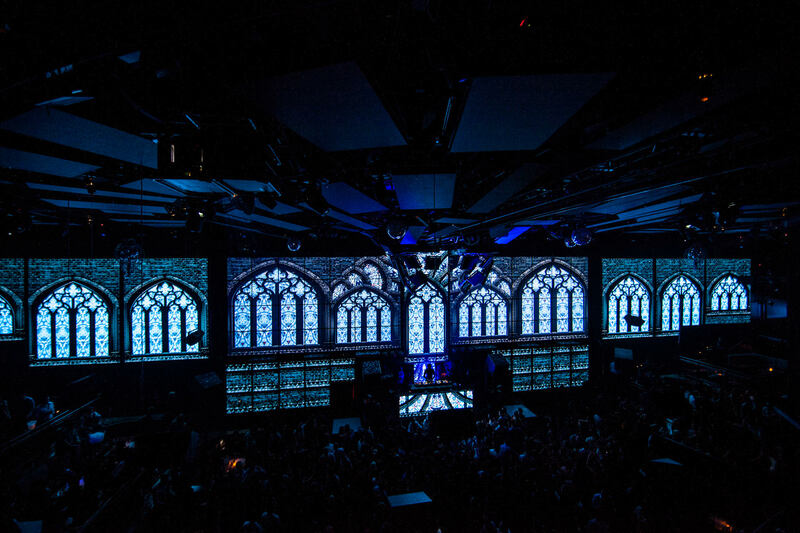 Set next to the LED displays is a second special set of screens made of a translucent polycarbonate material that serves as a front and rear projection screen, a vertical stage, and the theatrical space all in the same location. With Cirque performers climbing on and bouncing off the polycarbonate wall, it’s known as the Acro Wall. Because of its translucency, it also acts as a theatrical scrim. The Acro Wall is placed on either side of the DJ station. Each wall is 20 feet tall by 30 feet wide and fitted with tiled Lexan polycarbonate panels covered with a white translucent 3M Scotchcal perforated window graphic film (IJ65) with a 50% transparency projection surface. More than just a projection space, the Acro Wall also serves as a staging area for immersive visual effects with Cirque performers. The Acro Wall is actually a set of walls that act as a hollow chamber; behind them is an enclosed performance space. The space also features winches in the ceiling to lower and lift backdrops and props. On the back wall, Lyons says, “we have two large roller scrims that are rear-lit by 2,000 RGB nodes. When in the down position, this creates a rear backdrop that presents a glowing depth behind the performance space. When rolled up, it reveals a high-output matrix of pattern and color, creating a fourth dimension with the Acro Wall.” Lit from the back, the Acro Wall becomes a theatrical scrim and a window into the magical manipulations of vignettes by Cirque du Soleil performers. A small back-room collection of lights create that visually transparent look, Lyons says, including basic wash fixtures, LED units, and some intelligent spot and beam instruments located on the floor, all dedicated to backlighting the wall. The acro wall’s hollow chamber also acts as a curtain, which can be immediately filled with fog, obscuring any sudden change out of scenery or props. 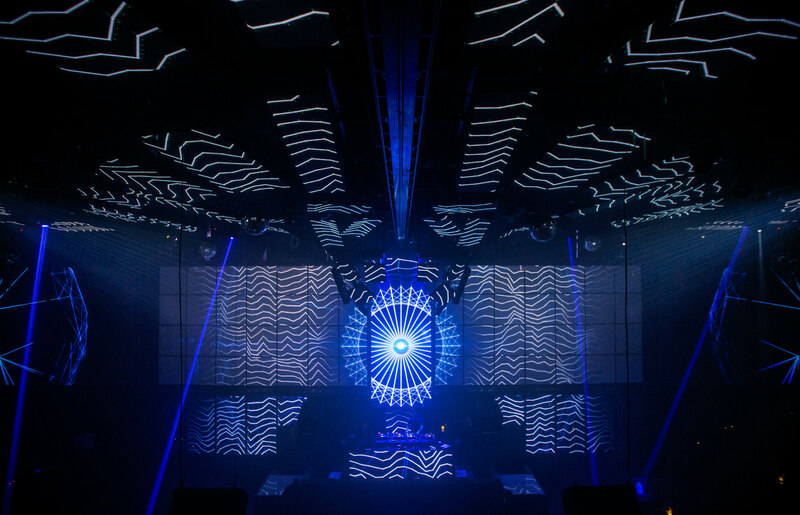 The wall also has a collection of RGB LED color baton strips lighting the floor and the sides of the hollow chamber and colorizing the fog as needed. Illuminated from the front, the acro wall is a screen for video projections. Light has four Barco HDXW-18 WUXGA DLP video projectors, each outputting 18,000 lumens. A Dataton Watchout media server delivers content. 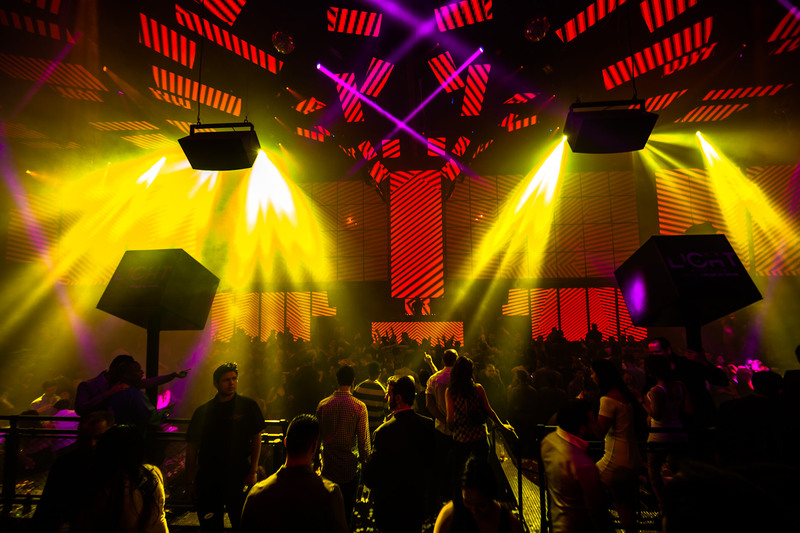 What separated LIGHT from other nightclubs was the injection of live theater into a pre-existing nightclub environment as a new kind of clubbing ambience. 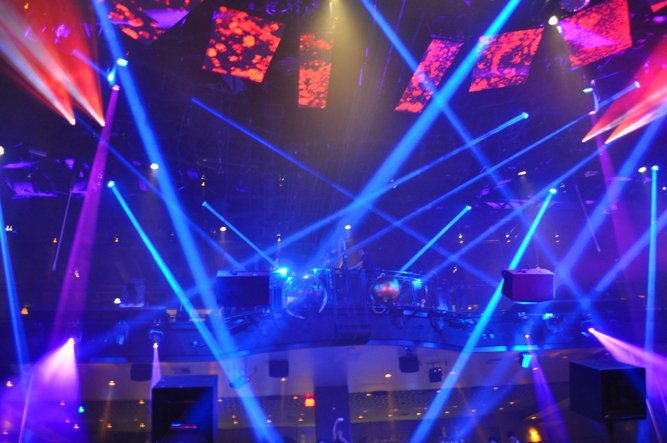 Given the various performance vignettes, the venue became a 360° stage. 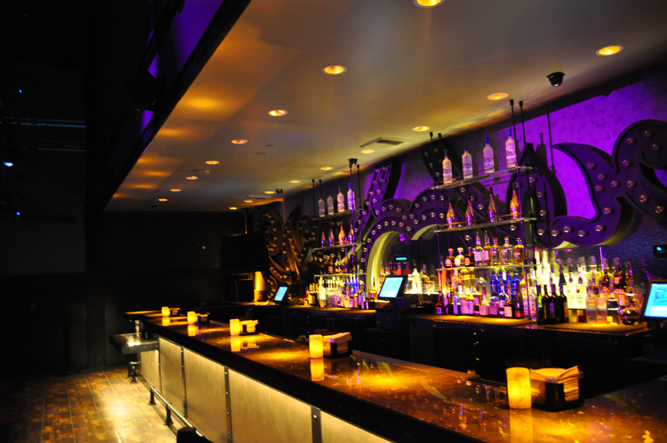 LIGHT, along with the Revolution Lounge and Gold Lounge, were huge successes. 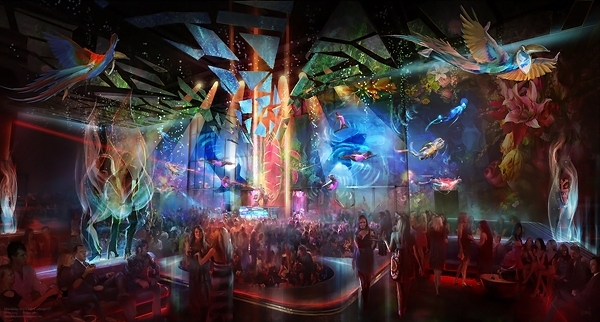 However, two market changes affected Cirque du Soleil's foray into the hospitality business. 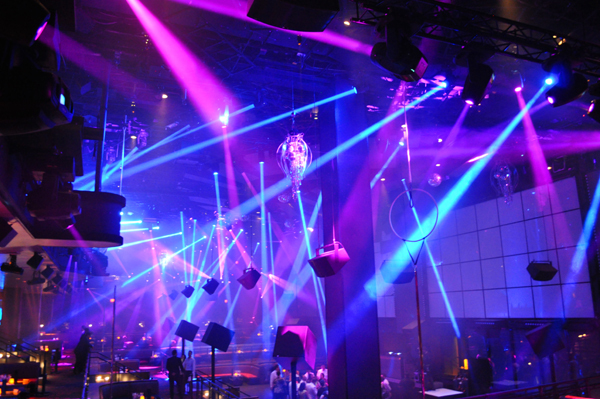 First, in December 2014 the Hakkasan Group (a worldwide hospitality company with establishments across North America, Europe, the Middle East, Asia, and Africa) purchased The Light Group, who operated Cirque's hospitality properties in Las Vegas. And Second, the April 2015 sale of Cirque to controlling entity TPG Capital, who had no interest in nightclub ownership. 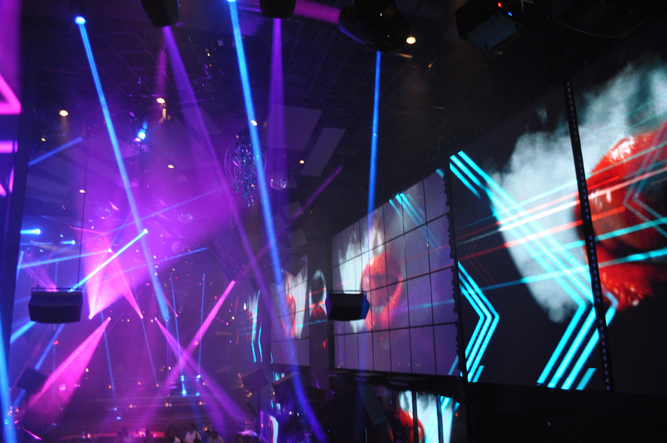 There's a relatively slim profit margin for the amount of work and organization required to effectively operate a nightclub on the Strip, and it is a highly competitive, often cutthroat business. 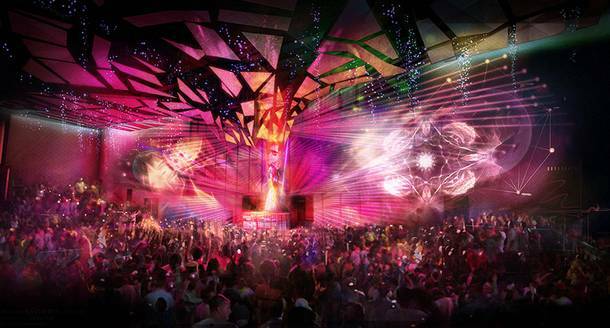 Thus, on October 9, 2015, Cirque officially announced that they decided to pull out of all hospitality projects. 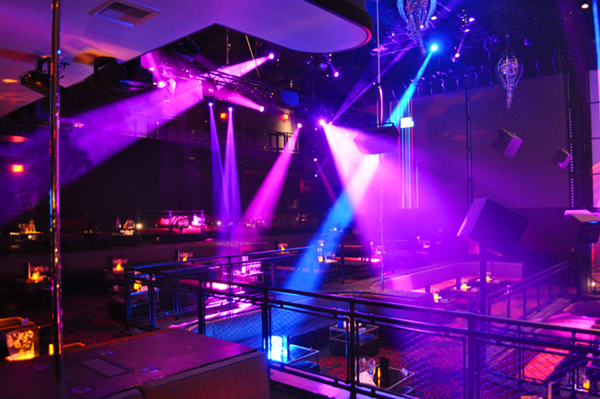 While LIGHT would stay open (albeit with all the Cirque aspects removed), REVOLUTION Lounge at the Mirage and GOLD Lounge at ARIA would close and be replaced.